At 12h41, Tuesday, 01 July, NSRI Kommetjie volunteer sea rescue duty crew were activated following reports of a yacht run aground at Misty Cliffs (between Kommetjie and Cape Point). 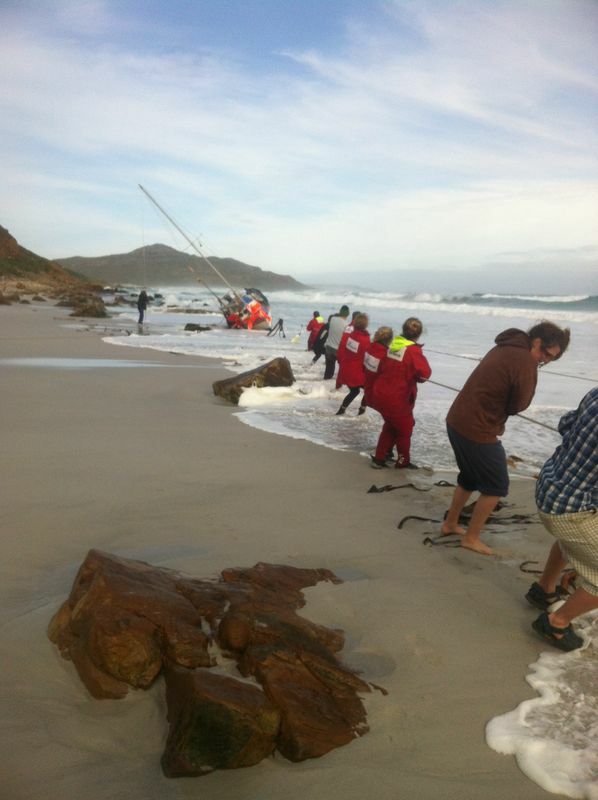 NSRI Kommetjie volunteer sea rescue duty crew and CMR (Cape Medical Response) responded. WC Government Health EMS and NSRI Hout Bay were placed on alert. On arrival on-scene solo sailor Anthony Smith, aged approximately 60, was on the beach with his 26 foot yacht BELLA ANDREA. He was cold but not injured. Mr Smith, who lives on his yacht in Hout Bay, told NSRI he had launched early this morning to sail to Simonstown but encountered increasing weather conditions and was not able to make headway. He attempted to raise help by sending out a Mayday distress call which appears to have not reached help and he then decided to rather beach his yacht in an attempt to save being swept onto and running aground on rocks. The yacht was found on the beach and although near to rocks he had managed to steer the yacht to a beach patch where there are no rocks. NSRI Kommetjie volunteers and bystanders assisted to secure the yacht in an effort to prevent the yacht being swept onto rocks in the incoming tide. NSRI Kommetjie took Mr Smith to shower at the Kommetjie Sea Rescue Base and local businesses, on hearing of the rescue, volunteered to assist – The Lighthouse Pub and Grill brought food and cool drinks to Mr. Smith and Kommetjie Laundry dried his clothing in their tumble dryers. At high tide the yacht will be secured higher up the beach. When sea states calm down Mr Smith will make efforts to attempt to relaunch his boat.